Iconic French cast iron cookware. A traditional French cooking vessel designed to concentrate flavorful juices, this hand-finished round cocotte is ideal for stews, soups, casseroles, roasts and braises. Enameled cast-iron construction distributes and retains heat evenly and effectively and requires no seasoning. Lid features self-basting spikes for continuous, even distribution of juices throughout cooking, so food stays moist and flavorful. Durable matte-enamel finish won’t discolor, rust or chip. Ceramic base is suitable for all heat sources, including induction. Dishwasher safe, but hand washing is recommended. Oven safe to 500°F. Limited lifetime warranty. Made in France. A traditional French cooking vessel designed to concentrate flavorful juices, this hand-finished cocotte is ideal for stews, soups, casseroles, roasts, and braises. Enameled cast-iron construction distributes and retains heat evenly and effectively for perfect results. Spikes on the underside of lid deliver continuous distribution of juices throughout cooking, so food stays moist and flavorful. Durable matte-enamel finish won’t discolor, rust or chip. Pot comes ready to use—no seasoning required. Cleans up easily in the dishwasher or with warm, soapy water. Suitable for all cooking surfaces, including induction, and oven safe up to 500°F. Dimensions and capacity: 4 qt., 11.9" x 9.4" x 6"
Got my sister the red one and she loved it (she cooks for two). I got myself the black one and had to send it back — the matte finish was really "dry" (like terra cotta pots and chalk, if you have that same sensory issue), plus it was smaller than my trusty le Creuset dutch oven and wasn't likely to get much use in our family of 5 because of that. My mistake for not paying closer attention to the size when ordering, but the finish was going to be a deal breaker no matter what. I have other Staub pieces so I know the quality is great, just didn't work for me. Cooks and cleans up beautifully! Love this pot. Seals flavor in food. Very versatile! I love my new Staub 4 qt Corcotte! Oven or stovetop straight to the table. I love the look, I use this pot everyday during the week for my inner put meals, everything cooks evenly and quickly. I put this put right on the table for serving. Clean up is so easy. The Staub 4 quart Round Cocotte is a great addition to my kitchen tools. It has been used twice since I received it a little over two weeks ago. It made a perfect shrimp gumbo with a perfect roux and a melt in your mouth Beef Burgundy. I love the basting feature that returns the juices to the pot. My only complaint is that I got home from major abdominal surgery 10 days ago with instructions not to lift anything over 6 lbs for two weeks. While the time passes I will be planning all the great meals that will come out of that Cocotte! I love the pan and it is the perfect size for me. I have already used it twice. I am so glad to have it and I am 83 years old!!!! Great pot for stewing, as the lid collects the evaporating liquids,which then drip back into the pot. Only regret I have is buying matte black. The finish is very unattractive,reminds me of a camping pot. In retrospect I would prefer the glossy finish of the colored cocottes. This cocotte, my first piece of Staub, will not be my last. This is a wonderful, versatile addition to any kitchen. Browns and heats so evenly and cleans effortlessly. Also love the colors. The purchase was a gift and she loves it!! This was a gift for my daughter and she loves it. She has used it many times already. Love the size and the ability to cook on top and in the stove. Love it! Versatile, durable, heats evenly and retains the heat. Perfect size for a winter stew. It is very easy to clean as well. Consistent Staub quality, 4 quart is a great size for a smaller family - perfect for soups, casseroles, mac and cheese! The turquoise color is fun and different! I would recommend this beautiful piece of equipment. Love the self basting lid and the fact that it works very well on my induction stove top. Bought as gift. They loved it and it’s a beautiful piece of art as well! 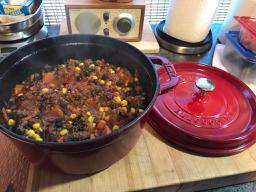 I've been using inexpensive enameled cast iron dutch ovens for a number of years. They are among the most versatile pieces of cookware, so I finally took the plunge on a Staub. I think the design is superior to other high-end brands. I was concerned about the black enameled interior, the complaint being you cannot see browned bits that might burn. This is simply hogwash unless you are cooking in the dark! I cook for 2, so the size is perfect for most meals. I got my 4 qt Staub Cocette for Christmas, and I absolutely love it! Not only is the cherry red color pretty, but the pot is so functional. It’s the perfect size for soups and sauces. This size is perfect it is also beautiful in the red. I love the weight of this pan. I also love the dimple top which is great for circulating moisture. It is all together a great addition to my collection. I have a few of my Staub pans displayed because they are just so beautiful in form and the colors are so vibrant. Don't forget the different handles! I have the Jacque Pepin rooster! Makes a great addition to the pan. I have a Bertazzoni gas cook top. With the various size burners, the Staub pot is awesome for controlled, even heat according to speed/heat desired for completion of food item. Good companion to appliance. I think it would be amazing for induction cook top as well. Easy to clean which is awesome and also really nice quality. The best I have had in my kitchen. Love it. I kept talking myself out of buying this, even with the great deal run during the holidays. Finally did it at the 11th hour and I do not regret it! It just sits on top of my stove now because I use it all the time. Do yourself a favor and just buy the darn thing. Beautiful pot, well made and a must have kitchen tool. 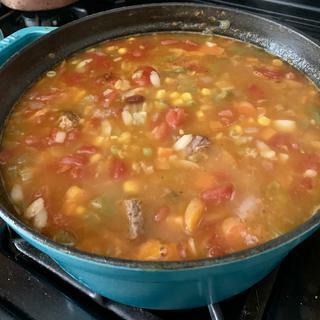 My Gram’s vegetable beef soup. I am in the midst of replacing all cookware with Staub. It is far superior to any I have used before (Calphalon, Fontinac, Cruset, Cuisinart). I need the 13qt and the 13" double handle fry pan and I am all set. Wish Staub made a double boiler. I think it Cooks faster, cleans easier, and it more attractive than the competition. Richer colors. The Staub cocette is my favorite piece of cookware I own. We use it for everything - sauce, soup, rice, meats. The nubs on the lid work as advertised for basting, and the non-stick coating works great. One pan was too large, the other too small...this one is Just Right! The Staub Round Cocotte fits the bill! It’s perfect for baking a stew or slow cooking. The even heating and it’s retention makes a meal on a cold winter’s day more tasty and comforting. The Cocotte is perfectly compatible with induction cooking, as well as oven use. I love it! My wife loves it!! Great deal, thanks! This pot is awesome. I am so happy to finally have one. I bought one for me and one for a gift. Thank goodness I kept one of these! This is perfect for everyday cooking and is as beautiful as it is functional. Cooks wonderfully moist and tender meats and stews. It is everything they claim it to be! Very heavy pot that cooks well. Staub makes the most amazing cookware. Made Shrimp & Grits in this and it came out moist and delicious. This will be my "go to" pot for small meals. Great product! I purchased this as a Christmas gift. The recipient was thrilled. The 4 quart capacity is a great size for 2-4 people, and I suspect she will use it often. She commented on its beauty and luscious color (red). She plans to leave it out on her stove top. When it comes to cooking cast iron is unrivaled, and Staub is one of the best. This is the perfect size for me and my husband. I've made soup, stew, even browned beef & chicken cutlets. It's pretty and so functional. The best part, SO easy to clean (no soaking required). I would highly recommend as it's so functional and nice enough to serve in and bring to the table! Love my new Staub Cocotte. The first dish I made in it was braised short ribs. They came out amazing!!! I decided to treat myself to a truly good Enameled Cast Iron Pot. One that I knew would not chip, last forever and not be made in China. After just a small amount of research on the internet, reading reviews and independent comparison experiments it was easy to decide on a Staub. I got the 4 quart because it was available at Sur La Table for an amazing price. 5 or 6 quart may have been a slightly better fit but I’ve been successfully cooking up a storm in this cute little pot. I know I’ll never have to replace this pan. Love this cocotte as it is everything as promised. Made a delicious rosemary chicken dish in it. My disappointment was that it was advertised as coming with a free gift which was a farm animal knob. I wrote customer service and then called about not receiving the knob. The attitude seemed to be that it was out of stock so I would not be receiving one. No mention of receiving one at a later date even though the knobs can still be purchased on their website. Why make a promise with a purchase and then not back it up? Great Pot - But, she wanted a color called "Le Mer"
It's the perfect size for my Breville and I've also used it on the stove top for my black-eyed peas on New Year's Day! Clean up is easy and I love the color too! Unbelievable, this is the best ever! No matter what you own, this cocotte is the best. Using it for soups, stews, sautés, browning, it does it all and is the perfect size for everyday. It is now my go-to pot and I own many others. Cleans up beautifully, looks amazing (mine is mat black). Wish I did this earlier. This is a great pot, perfect size for 2. It's much lighter than my 6 qt. dutch over. Very easy to clean. It's doing excellent job on every recopy I've tried. cute and practical. great for french onion soup. Great for chili and anything you want to brown or sauté as a first step. Hold heat well and is very even cooking. Things that stick to my stainless and are hard to deglaze are much easier. The reviews said it was hard to see with black inside, I am guessing that is for TV. Ecaise uou can easily see how things are browning. Big Things do come in Small Packages. Well worth the money. Remember to use Wooden or Silicone Utencils. This will be my first Staub and hearing such great reviews for the quality of this product I had to take advantage of the sale! so good looking I can put on the table to serve. A friend had this pan and I cooked a meal for us in it and I loved it! Love Staub and good price. I have been wanting this item for ten years, I could not pass it up at 75% off!!!!! I already have two of these and they are excellent. Great for making bread, easy to clean, and they look really great too. As expected with cast iron, fantastic heat retention. Have wanted something I have wanted and the sale price and free shipping were quite a deal. Also just happened to love the color. it is a great product at a great price. I wanted a Straub brand I have heard good things about quality. Staub is the best cast iron to cook with. It is a great vessel. Needed size. On sale. Reputation. a good friend recommended this product and so I'm giving it a try. Great price, reputable product, very useful size. I love these pans and I purchased this today because of the quality and price. I have always heard and read about the quality of STAUB products. Your sale made it very affordable to finally purchase my first item. The idea of simmering stews,and soups for a long time without food sticking to the bottom and ability to put pot from stove top to oven is very appealing! Can't wait to use it. I selected this for a wedding gift for my nephew and his fiancée because it is such a great product at an amazing price! Haven’t received it yet but I am attracted to the black interior and beautiful colors. I have heard nothing but good things about this cocotte from those who already own one. And I love red color! Cannot get enough Staub, and the price couldn't be beat. Love Staub cookware. brought some home from France. Couldn't resist this price. Bought one for my son and he loves it. He said that it was a work of art. Now I am giving one to my daughter for her birthday. Saw the Foodnanny using this and I really want to try it for my home cooking. It is a fantastic bargain and I ❤️ Staub! Induction cooktop ready - good price. I make a lot of soups/stews in the winter and this would be the perfect pot for that. The customer reviews were excellent - nearly all reviews were 5 stars. Will be using this as a gift next year and loved the fact that price for value afforeded me the opportunity to buy early! I expect to more nutritional and more delicious food! Does the enamel chip off easily, especially around the edge of the pot? and have several lids that are chipped and I don't know how it happened. I am really careful. I contacted Henkel and they never responded. Nevertheless, I highly recommend all staub. I use them daily. Yes, it can chip, especially on the bottom edges. Remember, it's cast iron on the interior, but glazed porcelein on the exterior. Mine has probably chipped by "rougher" handling on top of my heavy duty Wolf stove top steel grates. I've had no chipping on the cast iron lids. Just bought one with a glass lid & I will be VERY careful! No, it does not chip. The walls are thick and sturdy. No, it doesn't. The enamel is very durable. No,the enamel has not chipped off of mine. How many pounds does it weigh? BEST ANSWER: It weighs about 10lbs. It’s heavy, but that is part of its charm. It heats up quickly and retains heat for a long time. The lid is heavy as well and makes a perfect seal. Heavy, especially the lid, bit that is it’s best quality. BEST ANSWER: 11.9" x 9.4" x 6"
Can this be used on stove top? BEST ANSWER: Yes!! The Staub cocottes are wonderful on the stove top. I have an induction top and am totally spoiled by Staub quality. What color is the metal knob on the black one: goldtone or silvertone? How is this for baking bread? What size pot would be good for bread? We use a 3.5 qt. Lodge pot to bake bread, and it is perfect! BEST ANSWER: Staub offers a lifetime warranty. Will this pot hold a 6 lb. beef brisket to cook? BEST ANSWER: I don’t believe it would just because of the way brisket is cut. The Sur la Table oval Dutch oven works well with large pieces of beef & chicken. It could, however you would have to cut it in half and stack the pieces on top of each other. Think so! And veggies around it . do you need to season the cocotte again over time? what is the best oil to use for this? BEST ANSWER: There is no need to season these types of enameled cast iron (ECI). They are basically glass coated metal, not raw cast iron, so seasoning is not needed to prevent rust. You do however need oil it to avoid having food stick, and since the finish on the inside is matte there are small pores where oil with stick. You can season these, but you don't need to. I've had my Staub cocotte for several years and have not seasoned it again. I just used it yesterday and it seemed unnecessary to reseason the pot. I use my Staub frying pan and grill pan as well and have not had the need to season again. But if I did, I would use olive oil. Hope that helps. No, we’ve had this for about 3 years & it doesn’t need to be seasoned. I don’t know which oil is ‘best’ to use, We use olive or butter, only. Enjoy it, it’s a great cocotte! I haven’t but I think I will,I would use a high heat oil like grape seed oil. I love this cocotte ,btw, I highly recommend it! Will this work well on an induction stove? BEST ANSWER: These perform very well on induction. Simmering soups, making rice is a breeze with enameled cast iron and induction. Is the inside of the lid smmoth or does it have the staub-famous bumps on it designed to make the meats juicer? BEST ANSWER: Yes, it does have the stab famous bumps. I love the round cocotte. Great size and great price. It does have the bumps on the inside of the lid. BEST ANSWER: Yes. Depending on your flame, you may have to stir every so often to make sure there is no scorching, but that would be the case with any pan, from cast iron, to all clad, to le creuset. Alternatively you can simmer in a low oven, which eliminates the stirring issue. Yes, you could. I use it on the stove top or in oven for long periods. Yes! This pot is amazing. My favorite. I am looking at Staub and Le Creuset Dutch ovens. I have never owned any French cookware. I have a wonderful set of stainless steel kettles as well as two great heavy duty cast iron fry pans that are very old. I would love to get a Dutch oven. My question is. Which brand? What size? I’m cooking for two sometimes three. Would like to use for artisan bread baking and stews also soup. I have been eyeing this staub on sale for $99 (4 qt). Also looking at Le Creuset deep sided 5 1/2 qt 199$ I have not seen them in person so it’s hard to gauge the quality of each brand. Please advise ! BEST ANSWER: Hello! In response to which brand is best...I have both and I love both! I have cooked with Le Creuset for years and have a larger pot as well as a smaller one. However, I too wanted one for cooking soups and stews for 2-3 people and saw the Staub on sale. I grabbed it because I’ve heard that this brand is good and the price was awesome! It is absolutely perfect for my purposes...cooks wonderfully, is easy to clean and is the most beautiful cherry red color! I actually leave it sitting out on my stove because it is so pretty! The only difference as I see it is that the Staub is a prettier red...the Le Creuset is more of a traditional red. But you can’t go wrong with either brand! I hope this helps! We own both brands, having purchased the Staub 4 qt several years and several Le Creuset pots over 30 years ago. We think very highly of both brands and trying to choose between the two is pretty much impossible for us. That said, the two sizes you are considering are different and you might use one more for that reason. We are also only cooking for two that our children are gone but find we use a 6 qt Le Cruset more often simply because we are making stews, stocks, roasts, etc. The smaller Staub does not work as well for that purpose. But it is an incredible bargain at that price. If you can swing, I would buy both. I have the stabbing. I bought it a year ago on sale. I love this pot, I added a rooster for my entertainment because the pot was such a good buy. I don’t bake bread so can’t comment on that. I would start with no less than 5. Qt. Either one is good. Care tips please? I own this for more than 2 year and used only three time. Every time it stucks like GLUE and finally becomes impossible to clean. I also tried to season it a couple of time but still not working. Maybe I received a bad product? BEST ANSWER: I haven't had this problem. I usually cook with butter or olive oil when I use this pan and heat it on medium heat gas before increasing the temperature. The first few times that I used it there was a bit of a white residue that appeared after I hand washed and air dried the pan. This resolved when I added a bit of vegetable oil and rubbed it in with a paper towel. This doesn't seem to happen anymore though and I have never really had an issue with sticking. I love these pans and use them frequently from stovetop to oven. I use this product: Le Creuset Cast Iron Cookware Cleaner which I purchased at Sur La Table. It woks great on the inside surface as well as the outside surface. You can also try this: To remove stubborn baked on food, bring to a boil 2 cups of water and 4 tablespoons of baking soda. I think they might just be how they are. I own a ton of Staub cookware, and they haven't been as low-maintenance as I was expecting. When things are really stuck, I have to put some mild soap and hot water in the pot and let it soak for a little while before gently circling with a wash cloth. The finish on all my Staub cookware seems to change a little - it's not the same glossy black, though it doesn't seem to affect the way it cooks. I've tried rubbing oil on it after washing, but it never returns to how it was initially. The upside is how evenly they cook everything without burning. will i get the sale price? BEST ANSWER: Unfortunately no, as it's no longer available. Can you sear meats on the cooktop with Staub cookware? BEST ANSWER: Yes, it sears nicely in the Staub. If it’s the 4 qt size it may feel a bit cramped depending on whether the meat is a whole chunk or smaller pieces. I’v used my Staub 4qt to braise meat that I first sear in a fry pan and also for cooking beans and soups. It’s a great piece, we’ll made and durable. I dint cook a lot of meat, but I have browned onions and vegetables on the stovetop when using this to make risotto. I don’t see why it wouldn’t work for meats as well. I love my Staub! Yes, you can. I’ve made small pot roasts in mine...searing them first before slow cooking the roast and vegetables. Yes and clean up is a breeze, don’t forget a screen to control spatter. Absolutely. But better with a pan with ridges, so the fat can drain. Yes, you can sear meats in the Staub cast iron/enamel cookware. I have done it several times. Seems to work well for me. Yes. I use it to sear meats all the time. BEST ANSWER: The Staub 4qt Round Cocotte is my go to pot for chili, soups, spaghetti sauce. It heats evenly with no "hot spots." I also use a simmer mat underneath. I do season it after each use as a white area appears in the bottom of the pot after washing, which disappears after wiping the inside with oil. the only thing I've used this for is baking artisan or no-knead bread. I haven't used it stove-top, only in the oven, but it does a terrific job with round boules of bread baked at high heat. Hope that helps. Yes it cooks everything evenly nothing sticks to the sides. I’ve been very please with this product would highly recommend to anybody looking for a good Dutch oven.Enter an answer to this question. I have an electric stove, and I have no problem of using this Staub cocotte. Never had burned any of the meals that I prepared. Highly recommend this product. Yes, it heats very evenly, like all Staub. After all, it is cast iron. The lovely, easy to clean surface does not alter its cooking properties. Yes, it does. If you like to cook you will find dozens of application for this. It can hold up to a 6 lbs roaster and cook it perfectly. BEST ANSWER: I do not know. I have a gas stove. Ask Staub. I love my Dutch oven and gave one to each of my daughters. I use mine on a 20 year old GE flat "glass" cooktop with no issues. Yes, works fine. Be careful when you pick it up and put it down! Yes, it works on a glass top induction stove. Yes, I’ve done it many times! What is the difference between this and a Dutch oven? BEST ANSWER: I use it as a dutch oven. I think of a dutch oven as any heavy cast iron pot that has an equally heavy lid that traps in the moisture. Many people think of the heavy raw cast iron pots when they think of dutch ovens. This is a heavy cast iron pot but with the awesome bonus of the enamel coating. The enamel coating is non-reactive which means it won't leach and discolor your foods. The stress of cleaning cast iron is eliminated because you can use soap. You don't need to ensure everyone in the house treats it right..it won't rust. I could go on and on about the Staub pots but in short the cast iron/enamel product is wonderful. This is a Dutch oven, in fact this is the best 4 qt Dutch oven you will find and this price is only available once a year. I just bought my third because I will them all the time to cook lentils, black beans, boeuf a la bourgignon, chicken noodle soup, etc. A Cocotte is a French term for a Dutch oven,so they are the same. A cast iron Dutch oven like this is preferable to lighter weight aluminum ones and seals in flavor and also browns foods nicely. A great addition to a serious cook’s kitchen! I use this as a Dutch oven. It is heavy and the lid is a nice fit, so you can brown meat and juices stay inside the pot, while it slow cooks. Nice for roast, goulash, etc. This is a Dutch oven, in fact the best Dutch oven I’ve seen. Once you have one of this cocottes you will want to have several of them. Basically, the same thing, although Staub has lined their pot with nice anodized aluminum and the heat transfer is excellent. this is the same! Good luck. How deep is the 4qt cocotte? (inner height excluding lid) I would like to deep fry. BEST ANSWER: It’s 4” deep. Okay if not too many pieces. It is roughly 4 inches. I have used it for deep frying chicken and fish and it works fine. It is approximately 4 1/2 " deep. No idea. I do not have one. Can it be used on a gas burner? BEST ANSWER: Sure, it works very well on gas stove. However, I suggest to use the lightweight pot instead of cast iron on the portable gas stove. Yes, also electric and induction. BEST ANSWER: Wash with dish detergent, dry thoroughly, add a light coating of vegetable oil to interior. Very easy to clean, nothing sticks to it, just soap, water and a no scratch scrub pad. What materials are used to make this pan? How textured is the inside of the pot? BEST ANSWER: The inside of the pot is smooth black enamel. Nothing sticks to it, it doesn’t stain like Le Creuset and it washes very easily. Best 4 qt Dutch oven and this price is only available once a year. Can this be used for deep frying? BEST ANSWER: Sorry, I gave as a gift. They are very happy with it and use it often. How do I know the capacity by looking at the number on the base? I have a cocotte that has “28” stamped on the base. Is this a first quality pot? Not a 2nd with blemishes? BEST ANSWER: First quality pot! Gave one to my daughter for Christmas a year ago. She raves about it all the time. She uses it for everything. Even steaks! Yes, first quality. Staub is a great product.